Our office will be closed on Friday, April 19th and Monday, April 22nd for the holidays. 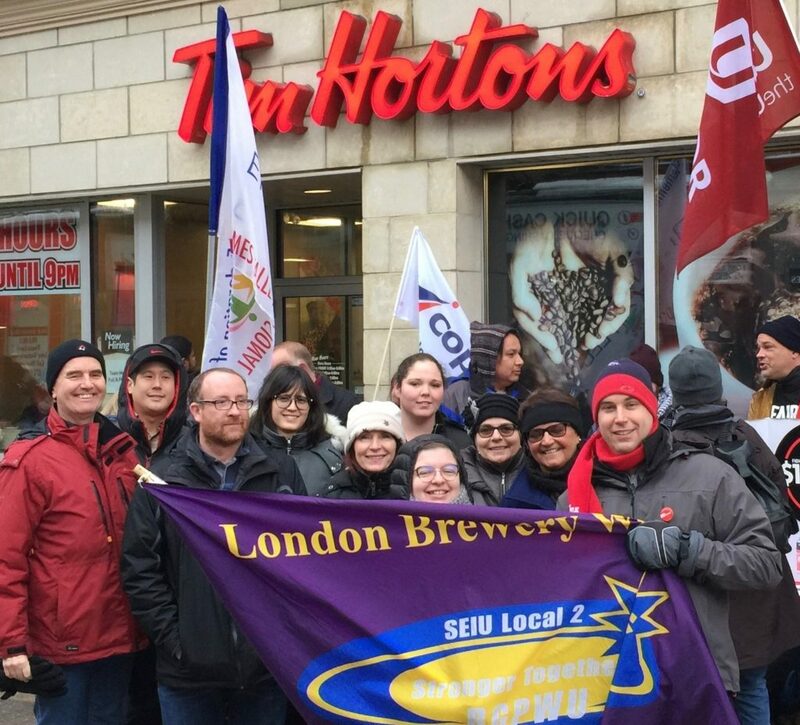 Braving cold and rain to show solidarity with the Tim’s employees within. View the entire NLSLM photo album. 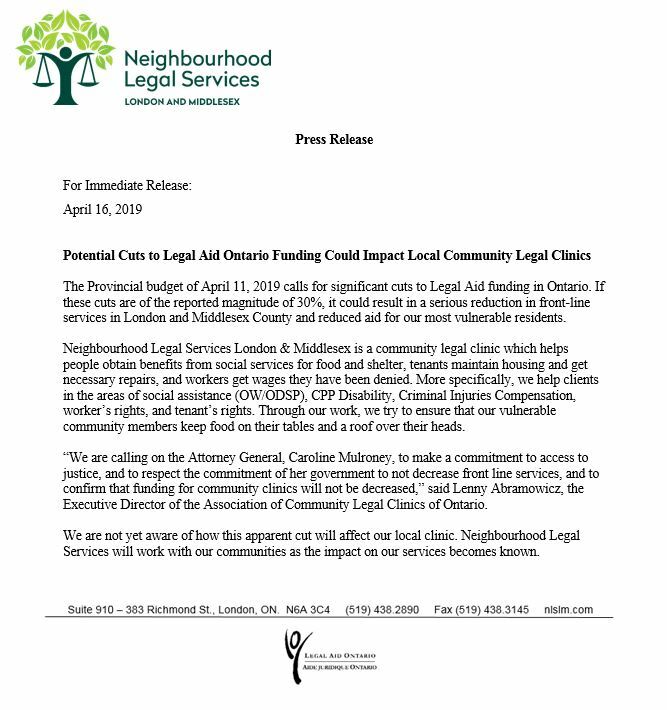 NLSLM is a non-profit community legal clinic funded by the government of Ontario. We provide traditional poverty law services to low-income residents of London and Middlesex County. This includes giving legal advice and referrals and sometimes providing legal representation. We are also involved in public legal education, community development and law reform. The best way to get help from us is to call our office. We can be reached at 519-438-2890. You will need to tell us about your legal problem. We can help if that legal problem is an area of law that we deal with. Primarily, we can assist with OW, ODSP, and CPP-D appeals, some employment matters, and landlord and tenant disputes. We might need to know your income in order to help you. If you want us to do anything on your behalf you must have a low income. If your income is from Ontario Works or ODSP you are eligible. You may also be eligible if you are on CPP or WSIB or if you have a minimal working income. You may still be able to receive legal advice from us even if you are employed. Contact our office if you aren’t sure whether or not we can help, or if you don’t know where to find help. We are open Monday to Friday from 9am-5pm, except Wednesdays when we close at noon. Are you a tenant looking for advice? We offer free summary advice for tenants as part of our Tenant Duty Counsel (TDC) program. TDC can answer questions about your legal rights and obligations as a tenant, and provide you information about the legal process. Free legal advice for tenants is available Wednesday mornings, and all day Thursdays and Fridays at the Neighbourhood Legal Services office. Tenant Duty Counsel is a walk-in service that assists tenants on a first come, first served basis. There is no guarantee that Tenant Duty Counsel will be available to speak with you. If you have to make special arrangements in order to attend our office, please call us the morning of to see if Tenant Duty Counsel is available that day. We can be reached at 519-438-2890. You can also visit Steps to Justice and the Landlord and Tenant Board websites to find reliable legal information about your housing rights. La Clinique offre des services de conseils juridiques sommaires et de représentation en anglais et en français. S.V.P. Contactez notre bureau pour plus de renseignements: 519-438-2890, poste 44. N.B. Le droit de la famille et le droit pénal ne sont pas compris dans cette liste et les personnes doivent être dirigées au bureau d’Aide juridique Ontario au numéro sans frais 1(800)668-8258. 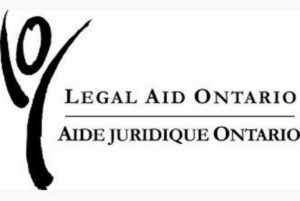 The “Handling Everyday Legal Problems” guide provides basic information about Ontario’s legal resources. This version was written for the First Nation,Métis and Inuit (FNMI) audience in Ontario.